Wow, this is really a loaded one. I have lots of advice to give. Specifically relating to changing diapers, birthing pigs, sweet-talking Sheriff deputies, throwing people off wave runners, getting a herd of kids ready for church, etc. Now let me clarify just a bit. I know all situations are different. But to whom I am speaking are those who are in situations where all the pieces are in place, so to speak. 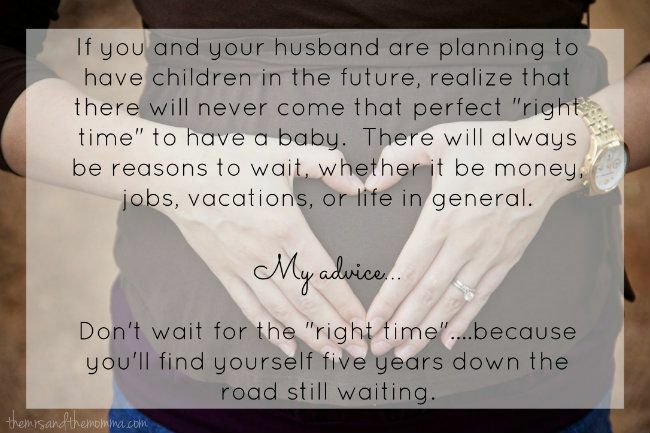 There will always be something, some reason, or some plan to postpone having children. Don't let that stop you. Don't wait. Yes there will be hardships and struggles (heck, just read Day 1 if you need an exhibit A), but your life will be so full of joy and blessings that you won't even remember why you once thought of putting it off. So if you're waiting for that "right time"... Know most probably that it'll never come. There will always be something. Thanks so much for Daliene for Sponsoring this past month!!! Yep, it normally doesn't. Good luck! I think this is just what I needed to see and read today as I have been strugglings with the answer to "Is it the right time to start trying for a baby?" Thanks for the advice! Aw, I'm so glad!!! Good luck with it, girl! I am a huge supporter of this! You'll never have what you think is "enough" money in your bank account, never have enough weekends of sleeping in, not enough vacations, etc...I thought we would have waited longer for babies but I am so so glad the Lord called us to parenthood! Definitely! And you are so meant to be a mother! So true! There will never be the "right time". My children are such a blessing, I can not imagine if I were still waiting to have them.